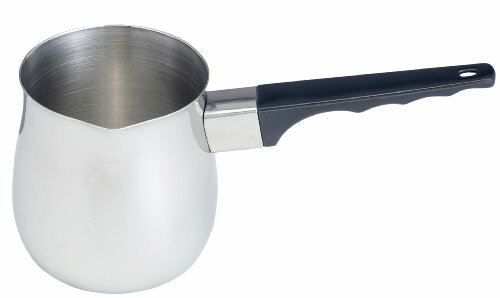 HIC’s Stainless Steel Turkish Warmer easily makes and serves traditional Turkish-style coffee. Its generous 24-ounce capacity is ideal for warming milk for the creamiest of hot-beverage creations. Crafted from professional-quality stainless steel to eliminate hot spots, it warms contents gently and evenly for less scorching, and it’s extra durable for long-term daily use. Specially designed for stovetop use, it features a longer contoured handle that’s heat resistant and super comfortable to hold. With a drip-free spout, pouring contents is effortless and controlled without the mess. Easily create everyday beverages or entertain guests for the holidays. Make traditional Turkish coffee, hot chocolate, or warmed milk and honey, melt butter for baking, dipping seafood, or topping movie-night popcorn, warm milk or cream, tea, sauce, gravy, and more. It’s a helpful addition to specialty coffee accessories for frothing steamed milk with an espresso maker, and perfect for baking, party food preparation supplies, and bar tools. Made from professional quality 18/8 stainless steel with a heat-resistant plastic handle, HIC’s Turkish Warmer is durable, versatile and easy to use. Hand wash in warm, soapy water.